After spending about 4 months with friends in Oregon and six months (off and on) with friends in the Los Angeles area, healing my body and my mind, I’m finally back on the road after two years of couch-surfing. I have not purchased another rig as I had hoped to in June 2016, but I’ve converted my Montero with 280,000+ miles into what I call my Expedition Rig. 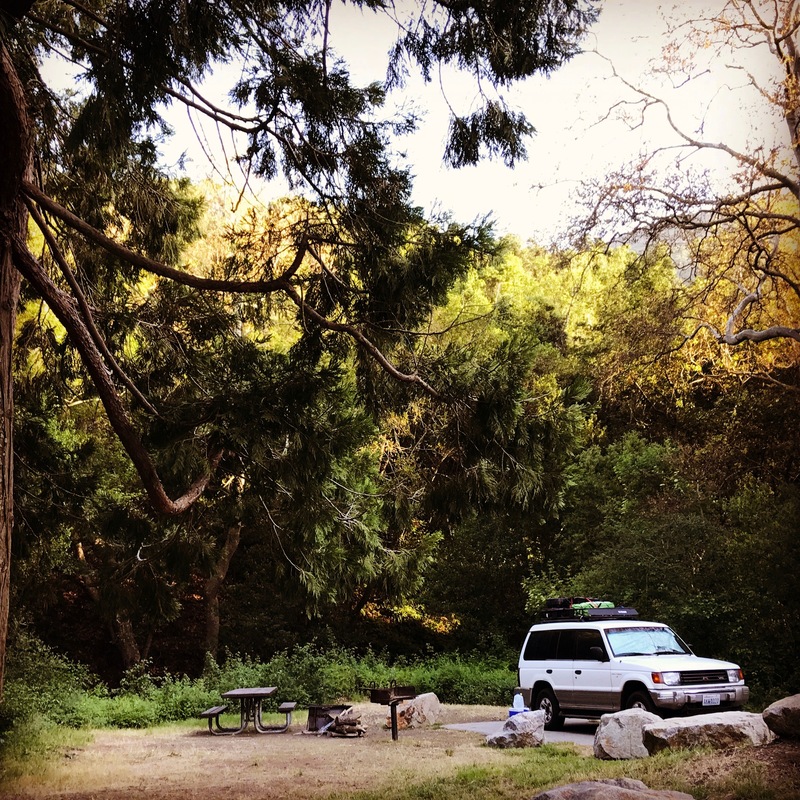 After spending a great deal of time and money in the mechanic’s shop over the past six months, I’m hoping to do more to create the living space inside that I need in order to continue to live on the road. My body is continuing to heal: my wrist still pains me quite often and it doesn’t have the strength or mobility it used to; my heart is still being monitored 24/7 (very thankful to the friends who contributed financially to the continuing monthly download) and the cardiologist is concerned about rate at which it is beating but not to the point of it being an emergency situation; the other physical issues have begun to recede and are not present 100% of the time anymore. I continue to try to eat well to keep my innards functioning; preparing healthy food on the road can be a challenge. I’m looking forward to an adventurous summer in the Pacific Northwest, excitedly visiting doctors and friends equally, camping out with anyone who’ll camp out with me, and discovering new places and revisiting old favorites. increase; a few of my doctors have released me because my symptoms are gone or are in remission. The remaining issues are my heart (“congestive heart failure” are ominous words, indeed! ), the ongoing physical therapy (daily exercises) for my wrist and ankle which I will continue on my own since I’ve cut the PTers loose, and a few body systems that are still not working properly but are getting better as we speak. I’m really looking forward to being back on the road this fall, in a new-to-me rig! Li’l Homey found a new home with a nice couple from Ventura, CA, where she’ll be loved and pampered forever. Or at least, for a long time. I’m now house-less once again as I prepare for the travel that Dinah Doggie and I talked about, and that I’ve dreamed about, for so many years. I’m looking forward to this next phase of life! It’s probably long past time to be updating this page. I write a lot about living in my trailer, traveling the West Coast, meeting people, having adventures, telling stories. But I haven’t updated this page since Dinah Dog moved on to the Rainbow Bridge in August 2013. I love traveling in my tiny little vintage trailer and guess what! It turns 50-years-old this year! Half a century for that little tin can on wheels. The past almost-two years without my big dog traveling companion have gone by slowly, but at the same time, I find it hard to believe it’s been almost two years. Not a day goes by that I don’t think of her, and wish I could pet her soft, furry head just one more time. I carry her ashes with me, as I do those of the three kitties I started this journey with and a couple of others who left Planet Earth in the years before that day when my life turned upside-down and sideways. During the last few years of Dinah’s life, she and I talked frequently about my plans after her dog job was finished, and I have yet to do any of those things we discussed. I know the day will come, soon, that I’ll need to follow through on those plans and at that time, I’ll be finding Li’l Homey a new home. It’ll be a new adventure, and at the same time, a passing of the torch, so to speak, because my life will once again be different than it’s ever been. I look forward to that time with great anticipation! April, 2012 My home these days is a 1965 10′ Aloha travel trailer. This is what it looked like when I picked it up and took it to my friends’ workshop in Canby, Oregon. 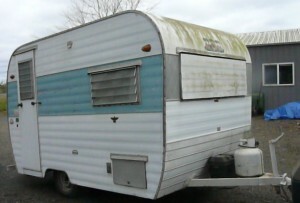 It needs some cleaning up, spiffing up, and a few new updates such as a propane tank, a house battery, a portapotty. I’ll post more photos as the work continues. I’ve named it Home Sweet Home and I think Li’l Homey has a nice ring to it. Once the spiffing and cleaning are finished, I’ll be piling myself, my 15-year-old golden retriever, Dinah, and my 10-year-old tuxedo cat, Louise, into it and driving off across North America, wandering around, roaming the back roads, looking for fun, food, and friends – not necessarily in that order. September 2012 As our journey continued, Louise decided to jump on Venus as it transited the sun on June 5th so Dinah Dog and I are on our own. Our plans changed due to weather and finances (not necessarily in that order) and we ended up staying in the Pacific Northwest for the summer and early fall. I continued to work on Li’l Homey, making her more livable, and taking her on some short trips, still in anticipation of the longer, round-the-country trip that I envision. August 2013 Dinah Dog left Planet Earth on August 6th just nine days after the first evidence that something was wrong with her body. Her physical absence has left me without words to express how difficult it has been without her here with me. I know her spirit travels with me and she continues to take care of me but I miss her doggy body terribly. More than words can say. Just how big is this trailer?